The only thing that my husband, Sean, loves as much as his kids is fishing. 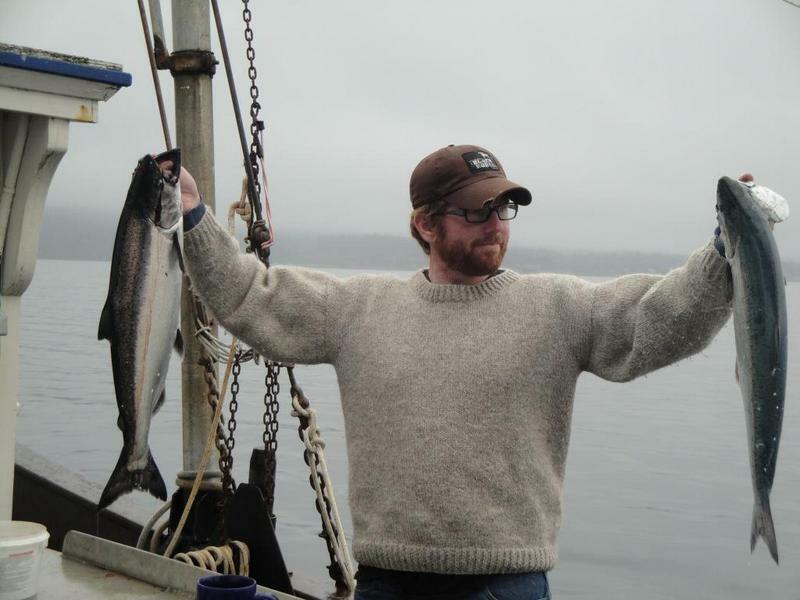 The last time his dad was out visiting from Newfoundland, Sean took him fishing and they caught two 8 lb. salmon. They were beautiful, pink and just waiting to be dinner. The first one we cooked right away and ate until we were stuffed. The second we froze and saved for sharing with our family. Somehow there were leftovers, and since we had dinner plans all week, I threw the cooked salmon into the freezer to do something with later. There was no way I was wasting a single bit of that amazing Salmon. I haven’t been able to come up with anything brilliant to do with this salmon until one night when all I could think about was a delicious, creamy pasta. Thankfully I had everything on hand to make this amazing dish. It has a wonderful combination of fresh lemon with crisp peas, a creamy sauce and amazing salmon. Really, it turned out a hundred times better then I expected and I couldn’t wait to share it. I’ve used a combination of cream cheese and milk to lower the overall fat since I’m also using butter and parmesan. If you aren’t lucky enough to have some salmon just lying around, this pasta would work with any seafood. I could see fresh shrimp, scallops or prawns on top or a fillet of your favourite fish. Bring a pot salted water to a boil and add Penne, cook until al dente. Most packages give really accurate times. Melt butter over medium heat and add oil. 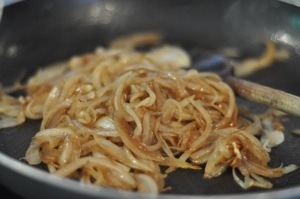 Sauté onions until translucent. 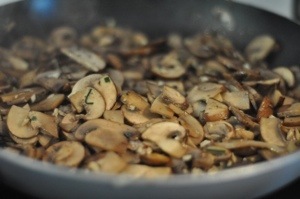 Add mushrooms and cook for a few minutes until they have reabsorbed any liquid the released. Stir in the garlic, lemon zest and parsley. Reduce the heat to low and melt in the cream cheese.Once the cheese has melted add the milk and parmesan. Continue to stir gently until the sauce comes together. I’m so excited that I have to share my news. My husband, Sean, was able to find work locally! For those not from around Vancouver Island this is a big deal. There is a limited amount of good paying jobs here and having one person working in Alberta has become a reality for a lot of families out here. Since last August, we’ve been a part of this group and it was beyond hard to be apart and to be on my own with a newborn and a two year old. SO, I am ecstatic. As well as being excited about him being around it also relates to meal planning. It means a shift back to the normal for us. He’ll be home every night and need lunches again. When I need work lunches, I schedule meals with leftovers every second night. This gives me enough lunches to get through the week without a leftover backlog in the fridge. Other than this big shift the rest of my week is low key. 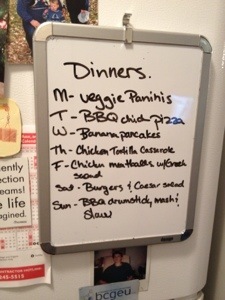 I want to make this a fairly easy week, meal wise, because it will be an adjustment to be on my own all day again. 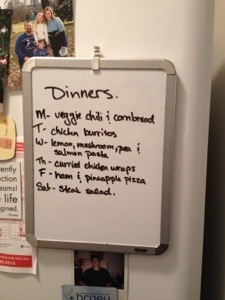 I’ve picked easy, quick meals and am lucky that my parents are having us for dinner one night too. Vegetarian Chili and Cornbread – Fortunately hubby’s work doesn’t start until the middle of the week so he has offered to make dinner. It’s his secret recipe so my contribution is cornbread muffins. I used Martha Stewart’s and they are delicious (massachusetts-corn-muffins). This will also be great as a lunch for him later in the week. Creamy Lemon, Pea and Mushroome Penne with Salmon – This pasta can be made in about 20 minutes and tastes like it could be in any fancy restaurant. I’m replacing the salmon with some prawns I have in the freezer that are crying out to meet this pasta. 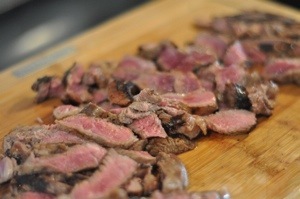 Serve with garlic bread a side salad and maybe a glass of your favourite white wine. Ham and Pineapple Pizza – I grew up with Pizza night and still love it. It was take out when I was a kid, but with how quickly I can pull a pizza together, I don’t remember the last time I ordered delivery. Spread pizza sauce on whole wheat Naan. Top with deli ham, diced pineapple and mozzarella. 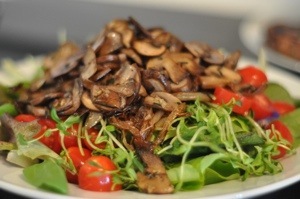 Serve with a side salad or fresh veggies. 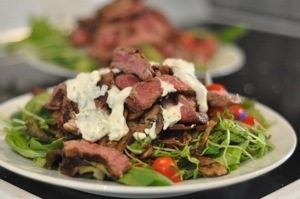 Steak Dinner Hiding as a Salad– I’m not someone who can sit and eat a steak dinner. It’s too much for me, but my hubby sure loves it. This salad keeps him happy and I think it’s delicious. It’s a great company salad too. 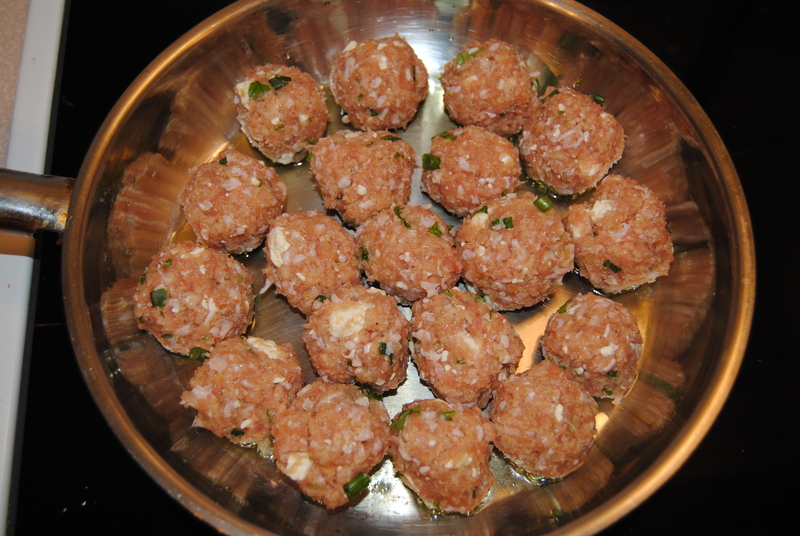 In fact, this was the recipe that most people have asked for. Dinner at my parents. It’s always nice to get a break from cooking and my other mother (I hate the word step-mom) makes fabulous Sunday suppers that leave us ready to face the next week. Enjoy your week and I’d love to hear about your meal planning tricks. 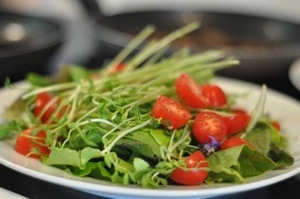 If you’re new to meal planning I have a post on the basics on meal planning too. I have my sister and her baby girl in town for a visit this week and we want to experiment with making some new baby foods. So I know I want at least two dinners that we can throw together in under 20 minutes. 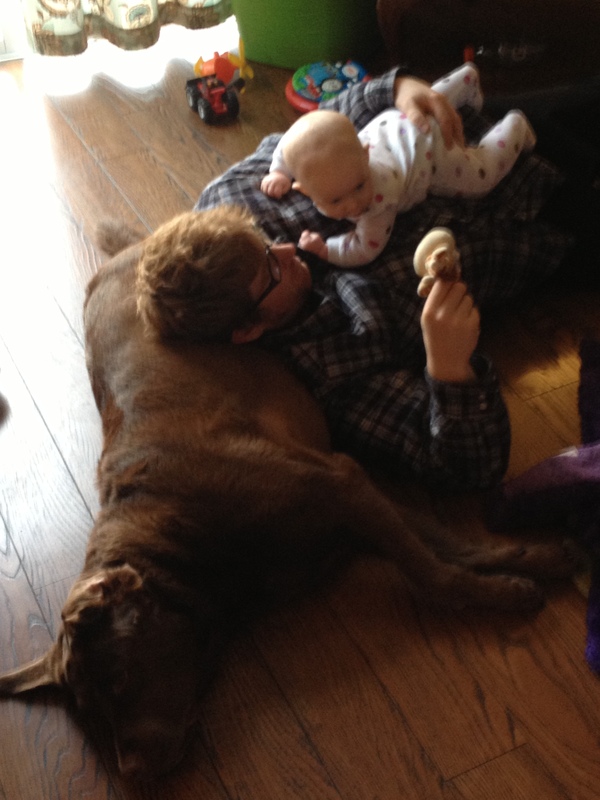 With my own new eater I’m finding evenings are getting a bit crazy. Dinner for me and hubby, a toddler portion and something for the tiny eater with a big appetite. I’m a firm believer in babies eating real food with flavour, so this of course means I create twice as much work for myself. Vegetarian Chickpea Tacos – I’m doing my grocery shopping on a Monday this week. This is my families favourite vegetarian (vegan if you don’t top it with cheese) recipe and it comes together quickly so I’ll be able to whip it up when I get home. I served this to my vegetarian sister and brother in-law when they were up visiting me from Florida and it was absolutely devoured. Breakfast for Dinner, Pumpkin Waffles with Chicken Sausage – A weekend experiment that translated into a fun, delicious dinner. I used the basic waffle recipe from the Joy of Cooking and added a 1/3 cup of canned pumpkin and pumpkin pie spices (cinnamon, allspice, nutmeg and ginger), about 1/2 tsp of each. The sausage came from our wonderful, local grocery, the 49th Parallel, that makes them fresh in store. Served with some fruit salad, my son and I declared it a solid hit! Roasted Chicken and Root Vegetable Fries – With a colder forecast this week I thought this would be a nice late winter warmer. I love that my son’s ideas about what fries are includes carrots and parsnips along with potatoes. I’m also throwing in an extra chicken breast for use later in the week. Toasted Tuna and Cut Veggies – I’m giving myself a midweek easy. Whole grain bread and some cut veggies make this a healthy and 10 minute dinner. 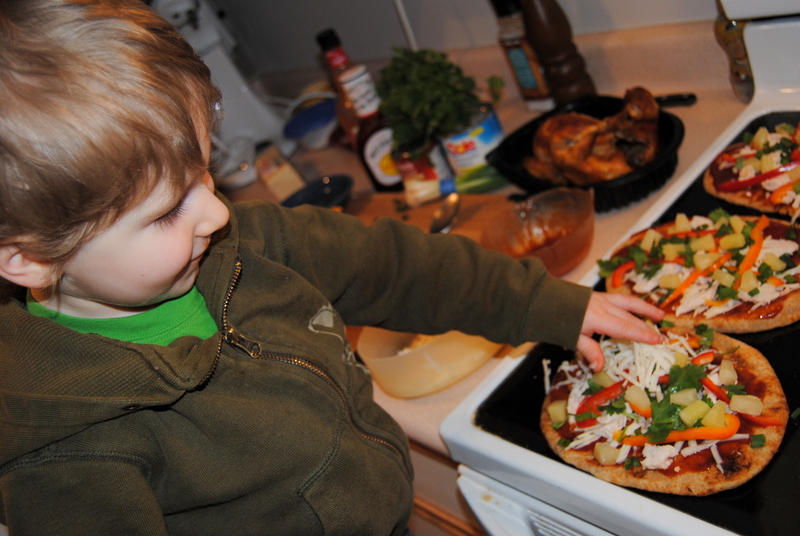 Pesto and Chicken Quesadillas – Here’s where I’m using the leftover chicken. Using a whole grain tortilla, spread a layer of pesto. 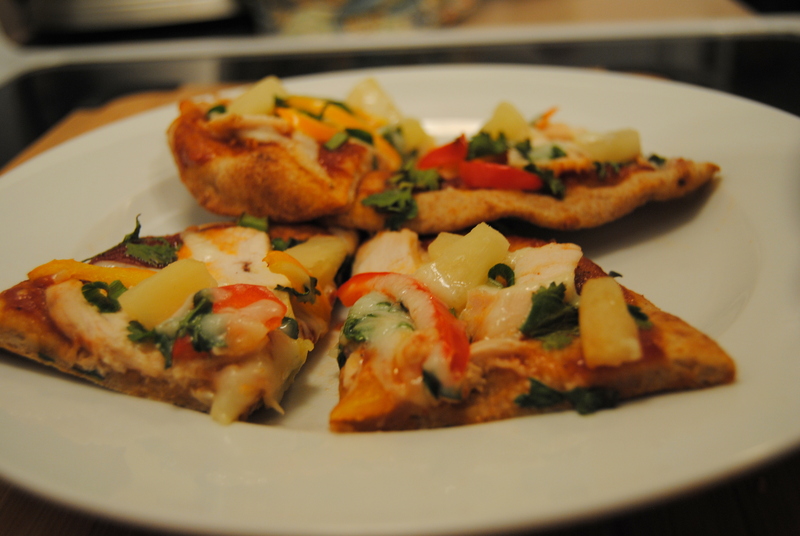 Top with diced chicken, diced bell peppers, diced tomato, some cilantro leaves and a layer of cheese. If your family likes a little spice a diced jalapeño adds that bit of heat. Cap it off with another tortilla and cook over medium until cheese is melty and the tortilla is a golden brown. Serve with some fresh guacamole and salsa. Hot dogs/Chili Dogs and Coleslaw – Yup, I eat hot dogs Who woulda thought, me being so mostly healthy and all. I buy the Maple Leaf Naturals. I never want to be that mom that cuts my kids off from everything because it’s not healthy, plus I really love chili dogs. So…I try to find the least processed, best option and have it occasionally. I also confess I use canned chili. I don’t like it enough to make it often and its hot dogs so it should take only a minute, right? The hot dogs are topped with a layer of chili and cheese and baked in the oven. My no fail coleslaw recipe is a grated carrot and 2 cups of shredded cabbage. For the dressing mix together about 2 spoons mayo, 1 spoon of vinegar and a sprinkle of salt and sugar. You’ll know by taste when you have the balance right. Pork Roast, Mashedo Potatoes, Chard and Pan-fried Apples – I’m pretty basic when it comes to seasoning my roasts and use salt and pepper with a little grainy mustard. I find most roasts take about 1-1.5 hours depending on their size, but always go by temperature. A pork roast is cooked when it reaches 170F. You can usually pull out a roast around 165F and cover with tin foil. 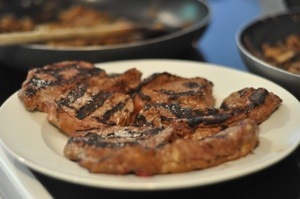 It will sit and continue to cook while it rests, making sure the pork is up to temp but also moist and not over cooked. Potatoes are mashed with butter, milk and a grated clove of garlic. I love sautéed chard with a little butter and salt and pepper. Yogurt on top after its cooked adds a great tang. My Opa always served pork with apple sauce and I feel like it’s not a pork dinner without it. Because I love to play with my food my version is a little different. 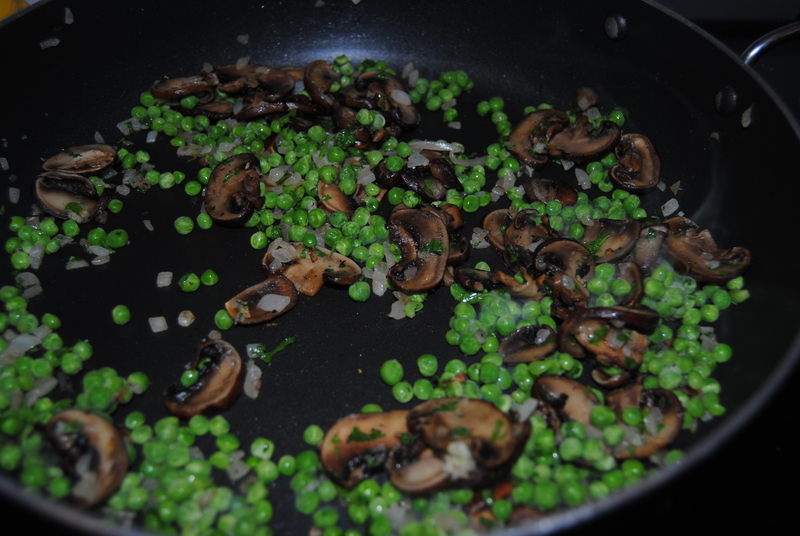 In a skillet sauté about a half a sliced onion over medium heat in 1 tbsp butter. Once the onions are translucent add thin slices of apple. I find a crunchy apple like granny smith works best. Season with salt and pepper, a sprinkle of allspice, nutmeg, ginger and a sprinkle of sugar. Add a 1/4 cup of chicken stock and simmer until apples are tender and cooked through. 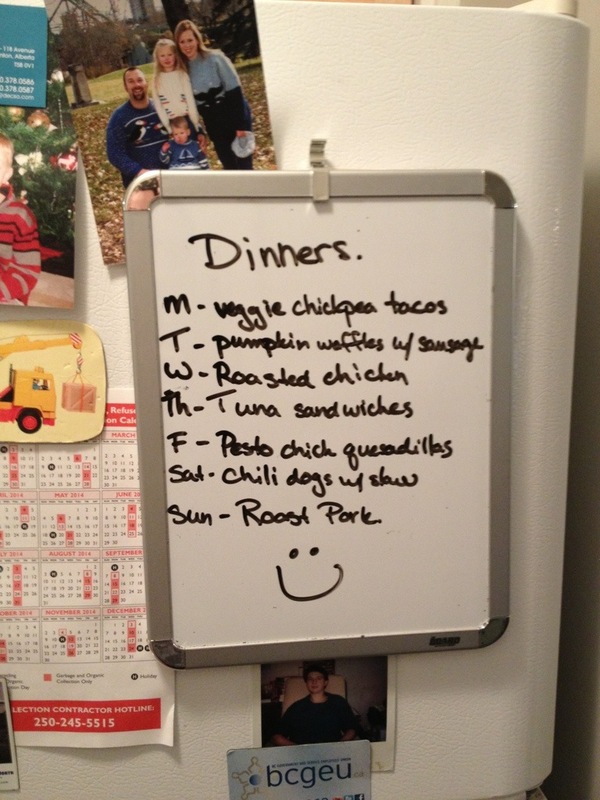 If you haven’t checked it out yet, here’s my post on how I create our families meal plan. 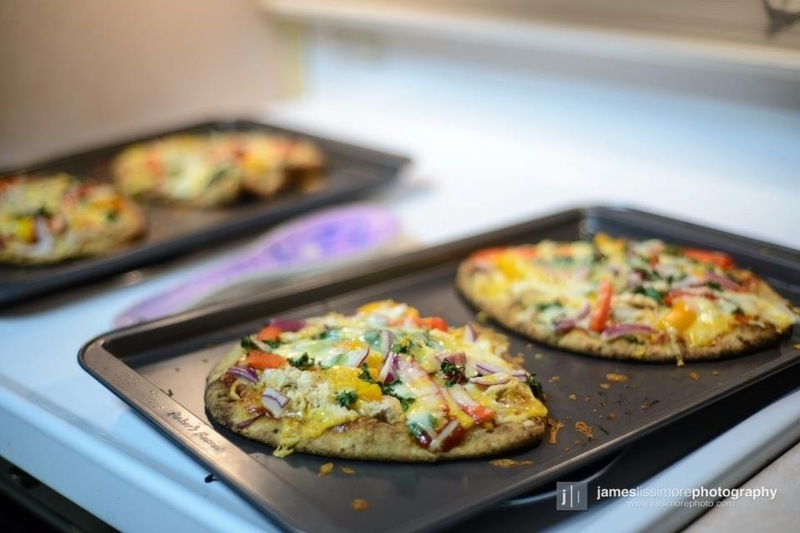 Enjoy your week and as always I love hearing how your family gets its weekly meals on the table and ways I can improve this blog. Categories: Meal planning Tags: easy meals, meal planning, vegetarian, weeknight dinner, what's for dinner.